Jannet Sylva is a 12-year-old girl who just arrived from Gambia. Jannet had a severe facial deformity from a benign tumor of the mandible that has changed her entire facial appearance. Although this tumor is benign (non-cancerous) and could have easily been treated when she was younger at first diagnosis, it was left untreated, and now it has become impossible to treat in her home country. The tumor has changed the size of her face and at least tripled the size of her mandible or lower jaw. It has caused such a deformity that she walks around with a scarf around her face and has been reluctant to go to school or engage with friends. 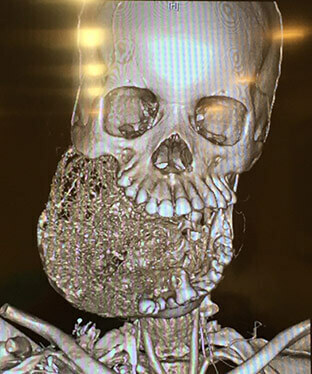 This girl will undergo a major surgical removal of the tumor and with immediate reconstruction of her lower jaw by a team of multi-specialists at Staten Island University Hospital. Dr. David Hoffman who is the head of the division of Oral and Maxillofacial Surgery at Staten Island University Hospital leads the team. Dr. Hoffman was first introduced to this girl through an e-mail that was forwarded from Healing the Children, Florida Chapter, from one of the local doctors in her hometown in Gambia. The e-mail asked for help to treat this girl, as treatment had no longer become available in her own country. Dr. Hoffman immediately responded and said he would try to arrange to have this girl treated at Staten Island Hospital. Once he saw the picture, he notified Donna Protske, the CEO of Staten Island University Hospital, who arranged for the care to be given by Staten Island University Hospital, part of the Northwell Healthcare Systems. Dr. Hoffman, once receiving approval for the treatment, notified Elissa Montanti of the Global Medical Relief Fund, who arranged for the transportation, housing and visa for this young girl. Although the picture that Dr. Hoffman initially saw is compelling, it was not until he first set eyes on her this past week that he realized the extent of her problem. Dr. Lydia J. Lam, Dr. Hoffman's associate, will be helping with the surgery along with a group of highly specialized surgeons at SIUH. Dr. Spiros Manolidis, a head and neck surgeon, and Dr. Al Culliford, a microvascular plastic surgeon, will also be helping to coordinate the care. Additionally, the team will also consist of our pediatric ICU specialists, interventional radiologist, and the head of pediatric surgery, Dr. Mitch Price. This week, the girl will be having a series of imaging studies and CAT scans to start to develop a treatment plan for her. Part of the treatment is going to be a significant amount of virtual surgery, a very high technical surgical approach. Initially 3D models of the jaw will be made from the CAT scan data and these will be sent to a company called 3D Modeling. In addition to the three-dimensional modeling to plan the surgical procedures, the team will do virtual surgery that will take them through every step of the surgery on a computer and provide an intricate method to reconstruct the lower jaw with a micro vascular graft from the fibula (leg bone). The virtual surgery will provide 3D printed cutting jigs and surgical guides to enable them to take a bone from the leg which is normally straight and have it reconstructed into a jawbone or mandible. The bone graft will have its own artery reconnected to an artery in the neck using micro vascular surgery. Additionally, prior to surgery, Dr. Jonathan Scheiner, an interventional radiologist, will minimize the blood loss by using an interventional radiology technique to embolize or clot off the major arteries to this benign tumor known as an ameloblastoma. This will hopefully minimize the blood loss at surgery. This is the little girl we brought from Gambia. When she arrived she would not talk, could barely eat, and would not make eye contact. This is her 4 weeks post op, waiting to get the feeding tube out. She just had the trach removed this week and for the first time could start to eat and speak. These are the first words she ever said to me. The team was Drs. Kasabian, Manolitis, Lam, and myself plus residents. Dr. David Hoffman and Healing the Children helped to remove a 6 pound tumor from a little girl's face to help save her life. This little girl from Gambia could not talk and could barely eat when she arrived for surgery. Her surgery was made possible by Healing the Children and the Global Medical Relief fund. The team will meet on a weekly basis until the time of surgery to coordinate the care and plan surgery for this patient. The surgical team, which is now assembled normally, treats tumors of the head and neck area. Although it is rare for this team to treat teenagers, they anticipate that their expertise can be applied here in a similar fashion. This team clearly reflects a change in the Department Surgery at Staten Island University Hospital, which has been coordinated with the Northwell Healthcare System with its attempt to improve the quality of care that surgeons can now deliver to Staten Island residents. The surgery that is being performed on this patient could not have been performed in this hospital several years ago due to the lack of surgical expertise as well as the incorporation of the computer-aided surgery that will be used for this patient. Although the surgery is highly risky, the experience of some of the doctors in the team led Dr. Hoffman to believe that this surgery can be accomplished and hopefully with a very predictable result. 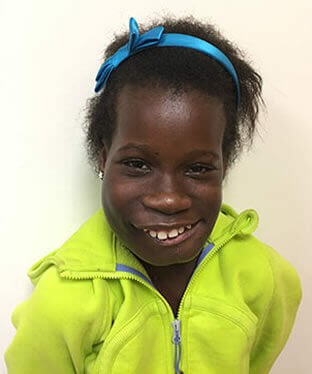 Jannet is a 12 year old girl from Gambia who can smile again after having a 6 pound tumor removed from her jaw. Staten Island Oral & Maxillofacial Surgery specializes in caring for patients with a variety of problems of the mouth, teeth, and facial regions including painful wisdom teeth, complex jaw deformities, or missing teeth. Patients share their experiences of having their missing teeth replaced with Dental Implants by Dr. David Hoffman in Staten Island, New York. Staten Island Oral & Maxillofacial Surgery offers dental implants in NYC that look, feel, and function like natural teeth. 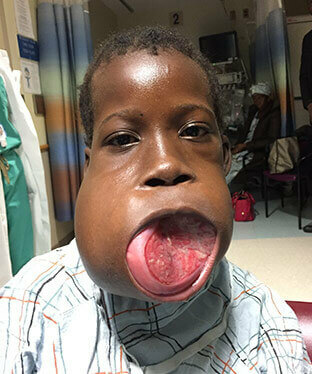 Parents share their experiences of having a child in need of cleft lip and palate surgery and their decision to have Staten Island oral surgeon Dr. David Hoffman perform the surgery. Dr. Hoffman of Staten Island Oral Surgery performs cleft lip and palate surgery. Staten Island Oral Surgery provides Cleft Lip and Palate surgery for patients in Staten Island, New York City, and New Jersey. Dr. Hoffman is Medical Director of Healing the Children, Missions Abroad Programs, a non-profit organization dedicated to the surgical treatment of children in Third World countries. Our oral surgeons of Staten Island Oral Surgery perform surgery to unlock the fused jaws of 2 young patients on Discovery Health. Each patient underwent Distraction Osteogenesis in Staten Island, New York to correct deformities in their jaws. Our oral surgeons continue surgery on 2 young patients. Each patient underwent jaw surgery to correct deformities in their jaws that prevented them from opening their mouths. Colombian children smile again thanks to Healing the Children. Healing the Children is a volunteer, non-profit organization that provides health care to Latin American children and children of Third World Countries. Dr. David Hoffman serves as the Medical Director for Healing the Children and has led over forty surgical missions to Latin American countries. He has performed surgery on more than 1000 children with cleft lip, cleft, palate, and other facial deformities. This video shows the before and after results that speech therapy can have for children with cleft palate. The video was filmed in Neiva, Colombia for the Healing the Children medical mission. Healing the Children is a volunteer, non-profit organization that provides health care to Latin American children and children of Third World Countries. Staten Island Oral and Maxillofacial Surgeon, Dr. David Hoffman, is the mission’s surgical director, and has been at the forefront of bringing cleft lip and palate surgery to developing countries in Latin America for more than 20 years and has personally operated on over 200 children.